Complex Says: When you have a Vespa, you're entitled to park the way other two-wheeled vehicles park: at a perpendicular angle to the sidewalk. 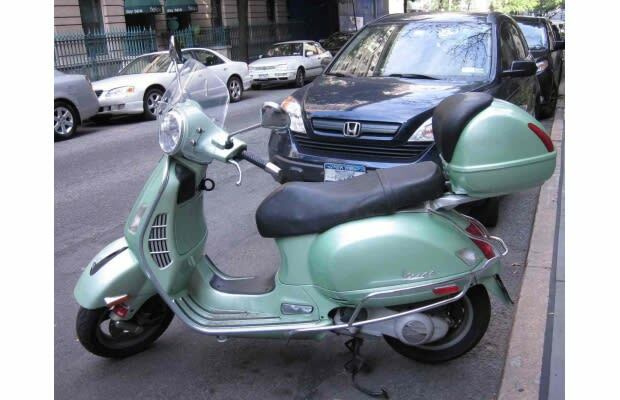 Most municipalities frown on parking your scooter on the sidewalk, so resist the urge to chain your Vespa to a bicycle rack, unless you know your city permits it. But the fact that you can squeeze into spots no car could ever fit should make you feel less frustrated about parking--especially riding in congested areas. It still doesn't solve your, "I'm only standing here with my hazard lights on in a permit-only street, Officer, not actually parking" woes, though. You're on your own with that one.